With the increase in the popularity of backcountry skiing, a number of incredibly helpful and easily accessible backcountry skiing resources have become available. They are mostly on the web; if you don’t have a computer (which would be difficult to explain if you are reading this), go to your local library. 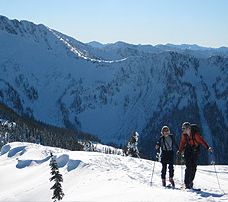 We have included a selection of backcountry skiing resources for you here. As this site grows, tell us about more worthwhile resources and we’ll be sure to include. This website for the Canadian Avalanche Centre should be checked before every tour. The site is remarkably helpful and provides current information for professionals and the public. There are also various avalanche assessment tools (such as the Avulator™ Trip Planner) which will help you evaluate the safety of specific tours on specific days. 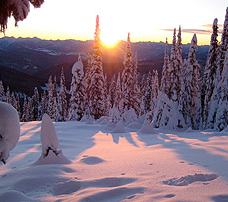 Avalanche bulletins by region, training, weather, and discussion groups combine to make the site an invaluable resource for any West Kootenay ski tour. These are the websites for Whitewater and Red Mountain. Check them out for current weather, bulletins and other info (even webcams). To get a view of Kootenay Pass, enter “BC Highway Cam Kootenay Pass” into your search engine and see the regularly refreshed web cam image. The BC Provincial Emergency Program created and manages the AdventureSmart program in response to the growing number of annual Search and Rescue incidents. AdventureSmart is focused on delivering a variety of programs to educate people going into the backcountry (and not just in winter). Check out the site for helpful info as well as a trip planner form. This is the site for Parks Canada (disponible en français aussi) where you can find more avalanche, weather and general information. This is the official Environment Canada website and is another excellent source of weather, including radar and satellite images.